This post is sponsored by Gorton’s. All opinions, text, images or video are 100% my own. 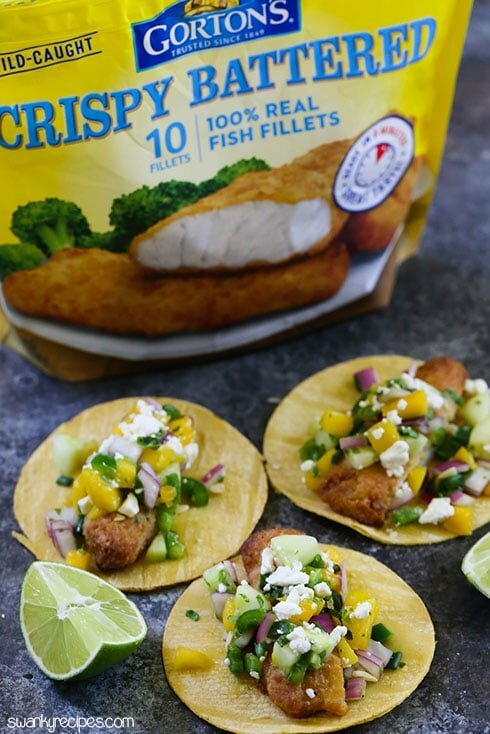 Crunchy street tacos made with crispy battered fish fillets and mango salsa. These tiny tacos are served on fire-roasted corn tortillas and are topped with feta cheese. The best way to make tacos for a busy weeknight dinner. You’ve never had street tacos this good until you’ve tried this flavorful combination! I can’t tell you how many times a month I hit up hip food trucks in New Orleans. At this point, it’s just too many to count! But what really has me hooked are super fun street tacos! It wasn’t until the city literally closed down on Mardi Gras Day and I was left wanting my favorite fish taco fix. Since the only stores open outside of the French Quarter were grocery stores, I hit up a local shop and bought all the ingredients to make my own. Since first making these tacos I’ve adjusted the recipe a bit. 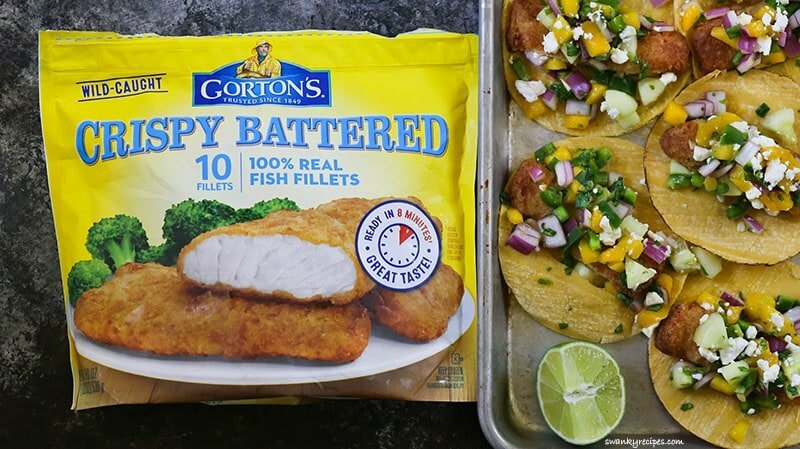 For starters, you’ll want to use Gorton’s Crispy Battered fish fillets. I love the extra crunch of the deep fried fish fillet batter with toasted corn tortillas. The texture of fish with a soft and slightly crunchy corn tortilla is everything when it comes to street tacos! Since street tacos have an emphasis on meat, I find that this Caribbean salsa recipe adds just the right balance of flavors to each bite. What’s nice about these street tacos is that they are convenient and an easy way to be frugal. I just hate buying a bunch of ingredients only to use a small portion and then the rest go to waste. With these tacos, you can use up a bunch of vegetables or just use what’s on hand. I love being able to buy a variety of Gorton’s products like fish sticks, fish tenders, crab cakes, and grilled salmon to use in easy weeknight dinner recipes. I love to pair each one with skillet green beans, roasted asparagus, fresh tomatoes, and a salad. With a variety of fresh products, it’s easy to add them to our dinner menu for a quick meal. If you’re like me, you like the taste of bold flavors and these Fish Street Tacos with Mango Salsa won’t disappoint! Each bite is loaded with fresh corn flavor from the tortilla, delicious crispy fish, and spicy sweet flavors from the salsa. With a little feta cheese and fresh lime juice squeezed on top, you’ll find that these tacos deserve the top spot on your dinner menu. 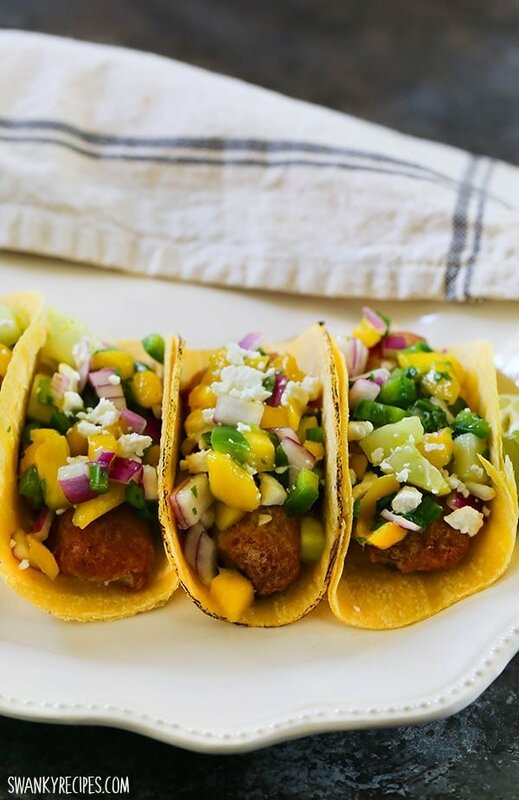 Crunchy street tacos made with crispy battered fish fillets and mango salsa. These tiny tacos are served on fire-roasted corn tortillas and are topped with feta cheese. The best way to make tacos for a busy weeknight dinner. You've never had street tacos this good until you've tried this flavorful combination! Bake Gorton's fish fillets according to instructions on the packaging. To make the salsa, peel mangos, cucumber, and onions. Dice all fruit and vegetables and place in a medium bowl. Add fresh lime juice and salt to taste as it will bring out the flavors. Toss salsa; set aside. 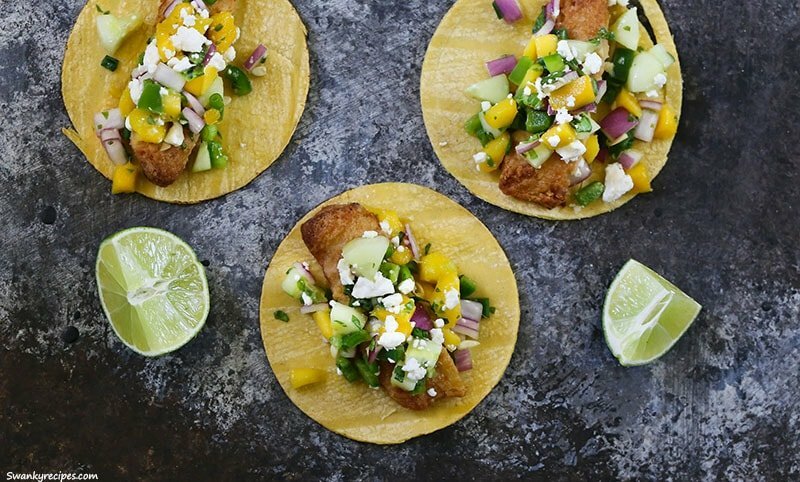 Assemble tacos with cooked fish fillets, mango salsa, and feta cheese. They look great! Being pescetarian, fish tacos are my favorite and yours, with that crispy battered fish fillets and the mango salsa look absolutely amazing. You had me at mango salsa. One of the best summer salsa recipes I think. Fish taco sounds so refreshing. Saving this for later. Helloooooo mango salsa!!! Looks so yummy! I love fish tacos. I love mango salsa, and I appreciate the use of cucumber in this version. Many times, I see mango salsa made with diced peaches. The cucumber brings this to a whole different level. 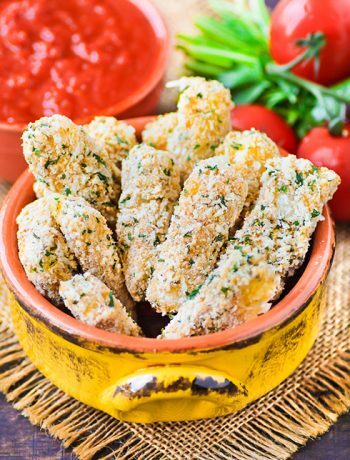 As a busy working mom, I really appreciate that this recipe started with some frozen fish fillets. Sometimes, it’s a struggle for me to come home from work, manage three children, and get dinner on the table. 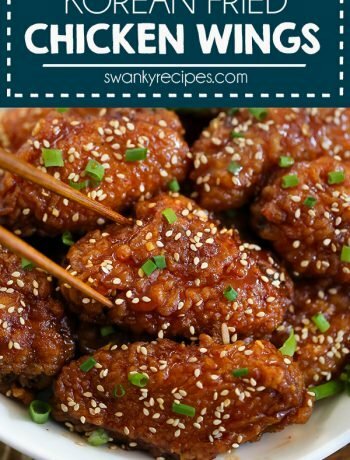 This recipe is brilliant and convenient! Fish tacos are my husband’s favorite food and they’re definitely in my top 10. I can’t believe we’ve never tried making these at home…like what even?! Can’t wait to test drive this! Street tacos are legit my love language. 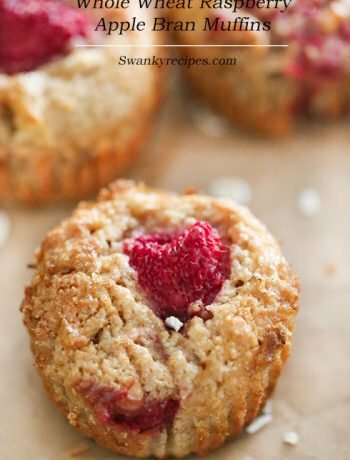 These look fantastic and I love that you can make them in a pinch! 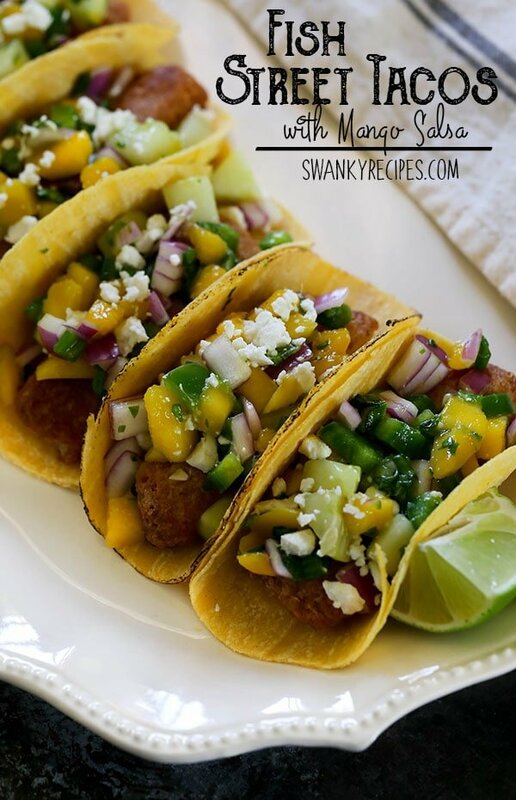 Fish tacos are delicious and I especially love the mango salsa that goes with them! So tasty and satisfying! Having the frozen fish on hand is always a plus in my book! Fish tacos = amazing! Mango Salsa = amazing! Fish Tacos WITH Mango Salsa = Show Stopper! I will be making these this week! mmm! these look delicious! I could just eat that salsa all by itself, but I’m sure it’s even better on top of those tacos!